1. Observe each and every single one of these last 10 nights because we don’t know where that treasure is. We want to be in a state worthy of khayr in these last nights. 2. Diversify our deeds – The best thing we can do in these last 10 nights is to stand in prayer and enjoy as much as salah as we possibly can. There is a beautiful statement by Imam Ash-Shafi’e rahimahullah, where he said that the way Laylatul-Qadr started was with a word “Iqra'” [read] to Rasulallah ﷺ and the Surah ends with “Wasjud Waqtarib” [prostrate and come closer to Allah SWT]. 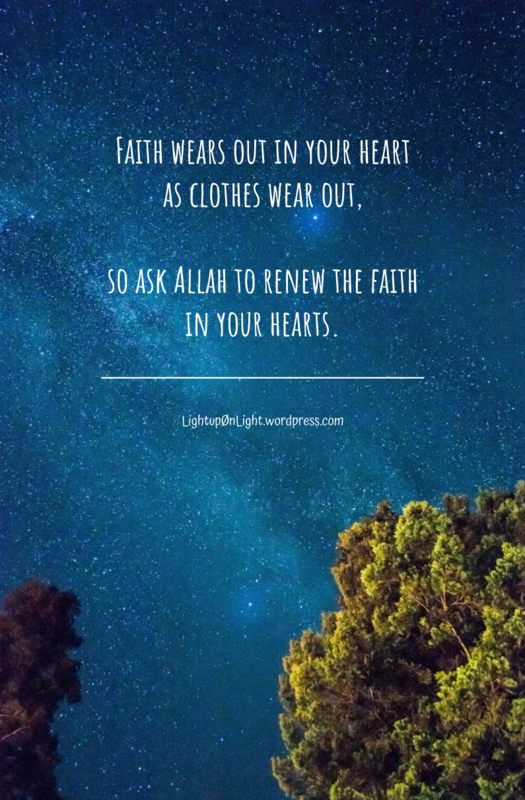 So Laylatul-Qadr should be spent with everything from Iqra’ to Wasjud Waqtarib – from reading the Qur’an, praying, prostrating, and coming closer to Allah SWT such as tasbih, dhikrullah and everything in between. Meaning it’s okay to switch to different types of ‘ibadah. The point is to stay engaged. 3. Watch ourselves from sinning – What we definitely don’t want to do on Laylatul-Qadr is to allow ourselves to be in a state of disobedience. Many scholars pointed out that in times in which good deeds are multiplied, the severity of sins is also compounded. Because it is as though we are purposely turning away from a massive blessing from Allah SWT, from a time where we should be exerting in khayr. The shayateen are locked away in Ramadhan, and on top of that, the angels descend on Laylatul-Qadr – yet we still found a way to be satanic? So watch ourselves in these last few nights. Don’t get caught in any act of disobedience. (Allahumma, You are forgiving, and You love forgiveness, so forgive me). This is the most beloved du’a right now. So when we find ourselves blanking out, or trying to think of the next du’a, or when walking, then repeat this du’a constantly. However, don’t treat it merely as a ‘transition’ du’a, because it is THE most special du’a that we should be making right now. From this we can derive that the best supplications on Laylatul-Qadr are the ones that entail forgiveness. There is nothing in the decree of Allah SWT that is more precious to us than His SWT complete forgiveness. 5. Don’t overlook kindness, generosity, and other good deeds – Did you know that the date of Laylatul-Qadr was lost because of an argument? So how bad would it be if on Laylatul-Qadr we got into a fight with someone? Don’t allow our ego to get in the way. Don’t get into arguments and backbiting. Smile and give salaam to people. It is better to remain patient so we may receive the blessing of that night. And lastly, show generosity. Exert ourselves in charity in these last 10 nights. May Allah SWT help us to fully utilize these last 10 nights. May He SWT accept all of our good deeds and forgive us all in this Ramadhan, and then beyond. Your car is gone. All your belongings – your wallet, mobile phone, laptop – are inside that car, and now they’re all gone. There is no one else around, and the next town is too far to travel by foot. How would you react? Most of us would probably go into panic-mode as that sense of fear and hopelessness sink in. carrying his provision of food and drink and it is lost. when all of a sudden he finds that camel standing before him. ‘O Allah, You are my slave and I am Your Rabb’. He commits this mistake out of extreme joy”. This hadith shows an imagery of a man, who having traveled in the desert on his camel, finds a shade and falls asleep. When he wakes up, his camel – on which are all of his sustenance and livelihood – is gone. In comparison to the scenario mentioned earlier before the hadith, this man is in a barren desert! There is no one around as the eyes can see, nor shops to stop by to rest and drink. There is no shelter whatsoever from the intense weather and other dangerous threats. Imagine this man trying so hard looking for his camel in that scorching, empty desert, until he reaches to a point where he completely loses all hope. He returns to his shade, overcome by tiredness, thinking that he is going to die there, and closes his eyes. When he wakes up, he sees his camel standing just near him. How would he feel now? Just a moment ago, he thought that he was going to die! If we want to comprehend the depth of this hadith, we need to understand how extremely relieved this man must have felt. The hadith mentioned that the man was soooooooooooo deliriously happy that he shouted: Ya Allah! You are my slave and I am your Rabb! He was extremely joyful that he didn’t even realize what he uttered. And yet – and here is the gem – Allah s.w.t. 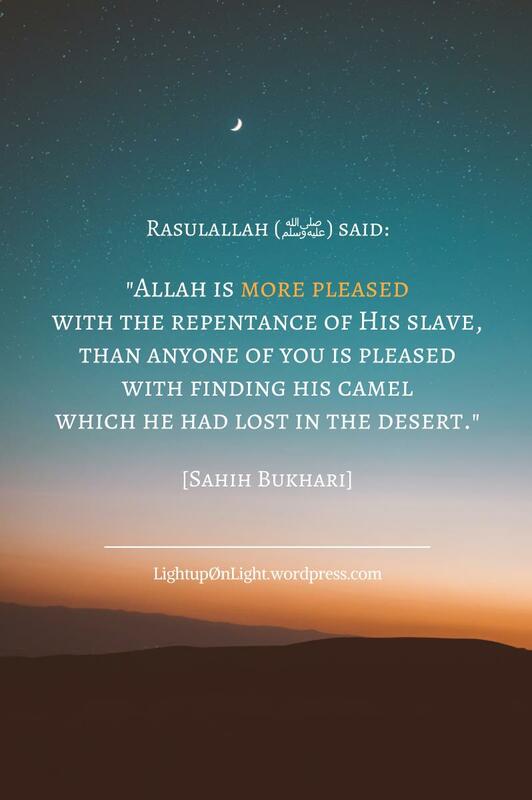 is MORE PLEASED with the repentance of His slave than this man! This is absolutely mind-blowing because we know that Allah s.w.t. does not need us. Does not need every single one of us. AT ALL. Subhanallah. Allah s.w.t. is At-Tawwab, the Granter of Repentance, the Acceptor of Repentance. Allah s.w.t. loves to forgive, and loves those who make tawbah. This is why we see the Name At-Tawwab is often mentioned alongside Ar-Rahim in the Qur’an. This hadith is meant to motivate us into action, to start abandoning our bad habits and bad lifestyle because after knowing this hadith, we should WANT to please Allah s.w.t.! There is nothing that should be more desirable for a believer than this! There is nothing more relieved, more joyful than to find that the Rabb of the heavens and the earth, and everything in between, is pleased with us. and loves those who oft-purify themselves (al-mutatohhirin). May we all return to Allah s.w.t. sincerely, out of fear of Him, and out of immense love for Him. When I first read this hadith, I thought that the physically stronger believers are better than the physically weak believers because they could help the Deen more, and achieve more. I’m physically not as strong as the average person, so I actually felt bummed about it. 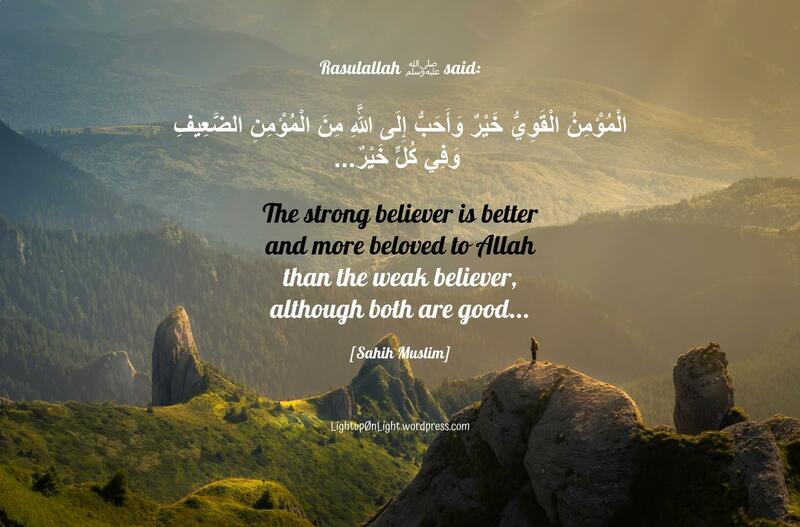 But alhamdulillah, when revisiting this hadith, the ustadh pointed out that Rasulallah ﷺ said “The strong MU’MIN is better and more beloved to Allah than the weak mu’min.” Meaning, the believer with a stronger iman is better and more beloved to Allah than the believer with a weaker iman. This is something that we can all strive regardless of our physical condition, insya Allah. Nonetheless it is praiseworthy to gain strength and vitality in order to worship Allah SWT for a longer period of life. Iman increases when we obey Allah SWT, His commandments and prohibitions; and it decreases when one disobeys Him, when we sin. The more branches of iman that a person commits in his heart, on his tongue, and in his actions, the stronger his iman becomes. So for example, a believer who fulfills all fard (wajib) commandments of Allah SWT, and on top of that has haya’ as the hadith states, has a stronger iman than another believer who also fulfills all fard commandments but lack in modesty. How much iman increases and decreases are dependant on our good deeds as well as our knowledge of the Deen. It is amazing that Rasulallah ﷺ said, “The stronger mu’min is better and more beloved to Allah than the weak mu’min, although BOTH are good.” Whether we have strong iman, or weak iman, have hope and have good thoughts of Allah SWT for there is still khayr in us. Subhanallah, such is the mercy of Allah towards the believers. And just as important – have good thoughts of your fellow Muslims too! It’s really disheartening to see people claiming to love the Sunnah, but bicker and belittle among each other, especially on non-principal matters in the Deen. We need to constantly remind ourselves to instil the fear of Allah SWT – because while we may think we’re a ‘better’ mu’min than others, we can actually be small in the Sight of Allah due to our ego and bad character towards others. to such of Our slaves whom We chose. and of them are some who are, by Allah’s Leave, foremost in good deeds. The first group of believers who wrong themselves. They do not do shirk, but they are careless in doing some fard (wajib) actions, and also commit some haram (forbidden) actions. The second group of believers who follow a middle course. They fulfill all fard actions and avoid things that are haram, but they do not go further than that, meaning they may neglect some supererogatory good deeds (extra deeds beyond fard), and do some things which are makrooh (disliked). and in between them are doubtful matters. Subhanallah indeed, the believer who falls in the third group is the stronger mu’min compared to the other two groups! May Allah SWT instil the love of iman inside us and help us exert to become a stronger mu’min. May we be amongst the third group who are believers that are more beloved to Him – Allahumma ameen. Rasulallah SAW taught us it’s not our lifespan that matters, but our actions. An average lifespan filled with khayr is definitely so much better than a long lifespan filled with sins. We seek refuge with Allah SWT from a long life that only increases us in sins. As we enter the year with new goals and resolutions, let’s also start with self-critic of our shortcomings. Do I enter the year with a stronger iman and better akhlaq than last year? Has there been an improvement in my relationship with Allah, and my relationship with His creations? Or is there an increase in sins, in bad habits and bad character instead? Am I getting lazier, or more cynical, or more prone to anger? Do I constantly demand for my right, but forgetting about fulfilling other people’s rights? “Have I truly improved myself?” is something that we need to ask ourselves constantly – not on a yearly basis, but on a weekly, daily basis. Our Deen always advocates that doing good should start right now, at this minute, at this instant. With family, job, and personal responsibilities, it’s easy to forget that our time in this dunya is actually tiny and miniscule compared to the time we will spend in our graves, and then compared to the time we will spend in the Hereafter. It’s easy to forget that this small fraction of time will determine our eternal fate in the Hereafter. without that detracting from their reward in the slightest. It’s good to have new year goals and resolutions, but not at the expense of forgetting the absolute reality that we will, very soon, return to Allah SWT – either in eternal goodness, or in eternal misery. So let these ahadith be a reminder to make important changes in our lives. The wise believer will realize the little time he has left, and will be busy planting seeds of khayr while he is still alive, so that he can harvest them and reap the reward in the Hereafter. Iman wears out over time. We might remember a time when we felt really close to Allah SWT, but now we feel distant from Him. We feel like we’ve taken a few steps back on some of the good deeds / good habits that we were able to attain before. What happened? Think about it: When we wash our garment over and over again, it will start to lose its color. Even if we do take care of the garment, its color will still fade naturally from the amount of washing that it goes through. So Rasulallah sallallahu ‘alayhi wa sallam taught us that it’s natural for our iman to wear out. It starts with asking Allah. Ask your Rabb, the One who enables our hearts, the One who settles iman in us, the One who responds to us – ask Him to renew our iman. And this should be one of our most frequent supplications to Allah. While praying for a new job / marriage / children / sustenance in this world, don’t forget to constantly ask Allah to renew your iman, because your iman is His greatest blessing! It is your most precious asset. If iman is gone, then everything else will not benefit you in any way. But if your iman is strong, then you can bear everything else of this world. our certainty (conviction / yaqin), and understanding (of Your Deen). May Allah s.w.t. keep our iman strong, and increase it until the Day we meet Him.